We’d love your help. Let us know what’s wrong with this preview of Jesus and Politics by Alan Storkey. To ask other readers questions about Jesus and Politics, please sign up. This is a worthwhile read. It took me a while to start getting really into it. But, I love the way Storkey takes the reader through the Gospel accounts, examining Jesus' sayings and interactions with those around him and how he uses this Scripture to form the politics of Jesus. I found this book to be both engaging and challenging. But, what I loved most was seeing Jesus for the awesome confronter of evil that he is, but in the most gentle way possible. I periodically make a mental list of five books to grab in case of fire. "Jesus and Politics: Confronting the Powers" is always number one on my list. I live and work at the crossroads of politics and faith. Many of my friends in the faith category don't understand how I can be a man of faith and work in the "unholy" political arena. Many of my friends in the politics category wonder what a man of faith is doing amongst them. Storkey breaks down the walls by demonstrating how radical Jesus was in I periodically make a mental list of five books to grab in case of fire. 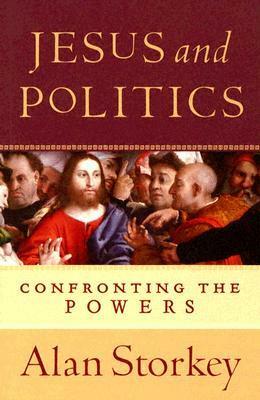 "Jesus and Politics: Confronting the Powers" is always number one on my list. I live and work at the crossroads of politics and faith. Many of my friends in the faith category don't understand how I can be a man of faith and work in the "unholy" political arena. Many of my friends in the politics category wonder what a man of faith is doing amongst them. Storkey breaks down the walls by demonstrating how radical Jesus was in confronting the "powers that be".